A new ad for Le Trèfle toilet paper shows one man’s obsessive quest to replace paper with digital in his home, constantly chiding his partner and child to use a digital tablet as the “better way” of creating art, leaving notes on the fridge door, playing a game or simply reading a book in bed. But digital technology has it’s limits, and his whole mission unravels when he finds himself sitting on the toilet with nothing but an empty roll of toilet paper. Then it’s time for ‘Emma’ to get her revenge. While there may not be a virtual bidet app, the toilet paper manufacturer has created a free iPhone app called ‘Où sont les toilettes?‘ that helps people find the nearest, and hopefully well-stocked washroom. 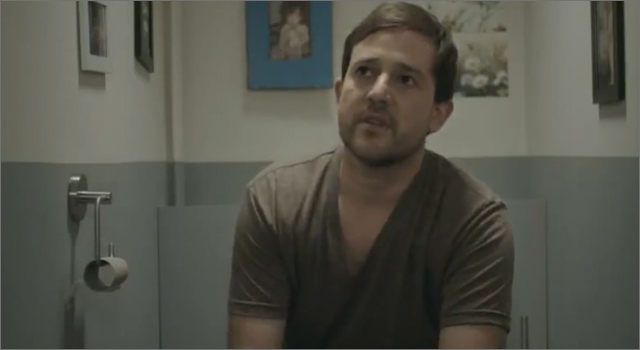 The ad was created by Leo Burnett France. The lowly Porta Potty may be a welcome destination when the need hits, but it’s also the last place you want to spend much quality time unless you’re looking to perfect your ‘hover’ technique. With this in mind, IKEA pulled the old switcheroo on people attending the Salone Internazionale del Mobile in Milan back in April. 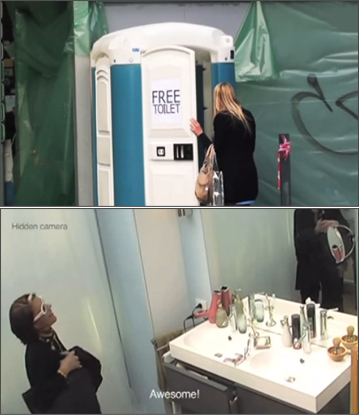 Relief-seekers were drawn to what looked like a common portable toilet, but was in fact a portal into a 20 square meter lavish showcase for their latest innovations in bathroom design. A hidden-camera captured the surprised reactions of washroom goers, as they tried out the products and features, and some even brought their friends in with them. The campaign comes from Milan agency 1861 United.